Louise Trotter is the new creative director at Lacoste. 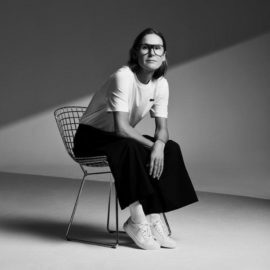 PARIS — Last October when Louise Trotter was appointed by Lacoste as its new creative director — and first female designer, heads turned. After all, in her previous position as creative director at Joseph, Ms. Trotter, a soft-spoken designer from Sunderland in the north of England, had quietly transformed a faded British label famed for its basics into an under-the-radar powerhouse for working European women in search of elegant separates and streamlined tailoring (often at a fraction of the price of other designer offerings). Married to the Japanese photographer Yuske Tanaka, with whom she has three children, the woman called the Queen of Clean by the British fashion press originally worked her way through the ranks at companies like Whistles and Gap, eventually being named head of women’s wear at Calvin Klein in New York. She then took a role at Tommy Hilfiger and did a short stint at Jigsaw before joining Joseph in 2009. So how will Ms. Trotter — a self-described “coat and knit enthusiast” — transform a French label best known for its alligator logo and polo shirts, and whose revenues topped the 2 billion euro, or $2.23 billion, revenue mark last year? Though she was relatively tight-lipped about her ideas during an interview before her debut collection, scheduled Tuesday as one of the last shows of the fall show season, she offered few answers. What I hope to do is build the brand beyond the polo shirt. I want to convey the Lacoste values in my designs: sporting ideas around tenacity, community and fair play. But I also want to deliver pieces based around how people actually dress. Today, people want to live longer, look younger and switch seamlessly between professional and social environments. They are constantly in motion. I think Lacoste is very well placed to cater to the current demands of that market. Now it is about establishing some foundational pieces and a new desirability to lines, starting with this collection. Do you imagine wearing your pieces as you design them? Personally I think you have to connect your work. If the clothes feel removed from my life then they don’t feel relevant. I am and always have been a pragmatic designer. I am very focused on creating clothes people want to wear and that perform. What makes the difference between a staple and something that sits in your wardrobe and never sees the light? I want people to wear what I design every single day if that is what they choose to do. Is there a disconnect between fantasy and reality for many fashion designers? I think so. I live a very normal life and I think that has to be an intentional thing for some people in fashion: to stay connected to your surroundings. I get on the Métro in Paris every day and I look at the people who sit around me. I look at my friends. And I think about all their needs, and how to make someone’s life that bit easier, and richer, through a wardrobe. The older I get, the less tolerant I am of superfluous design.